Box Text: Tee Off! It's time to play in one of the greatest golfing competitions ever: The Arnold Palmer Tournament. And he's not going to make it easy. With only 16 players allowed to compete, you'll have to prove to yourself to qualify. You may be playing on lush country courses, but there are plenty of obstacles, from water hazards to sand traps to the ever present rough. So pick your club carefully. Check the weather vane for the wind. Settle your feet and angle yourself exactly. Then go for the pin! Whether you're playing a course U.S., Japan or Great Britain, you'll need all your skills. Study the hole. Is it an impossible dog leg; Will you need to hook or slice down the fairway; how deep are you in the rough? Use the practice mode to prepare yourself. Whether it's precision of a par three, or the power of a long drive, you'll have to "charge". At least you can rely on your professional caddy as your right hand man. And remember Arnie's never away. 04-09-2017 shepard11 Box Text Tee Off! It's time to play in one of the greatest golfing competitions ever: The Arnold Palmer Tournament. And he's not going to make it easy. With only 16 players allowed to compete, you'll have to prove to yourself to qualify. You may be playing on lush country courses, but there are plenty of obstacles, from water hazards to sand traps to the ever present rough. So pick your club carefully. Check the weather vane for the wind. Settle your feet and angle yourself exactly. Then go for the pin! Whether you're playing a course U.S., Japan or Great Britain, you'll need all your skills. Study the hole. Is it an impossible dog leg; Will you need to hook or slice down the fairway; how deep are you in the rough? Use the practice mode to prepare yourself. Whether it's precision of a par three, or the power of a long drive, you'll have to "charge". At least you can rely on your professional caddy as your right hand man. And remember Arnie's never away. 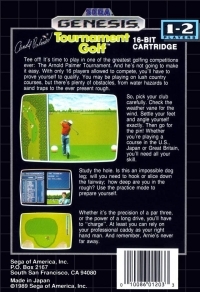 This is a list of VGCollect users who have Arnold Palmer Tournament Golf in their Collection. 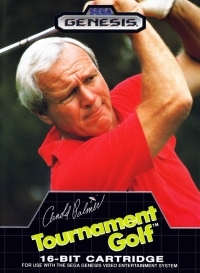 This is a list of VGCollect users who have Arnold Palmer Tournament Golf in their Sell List. This is a list of VGCollect users who have Arnold Palmer Tournament Golf in their Wish List.